Starting life back in the late 90’s as a covers band (back then they were called Powerage), Swedish band Axenstar eventually morphed into one of the better power metal acts of the new millennium. Between 2002 and 2006 they released four studio albums – the pick for me probably being 2005’s rather ambitious sounding ‘The Inquisition’ – but a less than stable line up has dogged them ever since. It’s now been the best part of five years since the release of their last studio effort ‘The Final Requiem’, but with a new drummer and second guitarist in place Axenstar are once again ready to do battle.Only vocalist/bassist Magnus Winterwild (originally Erikkson, Winterwild being his wife’s surname – a curious custom that seems somewhat prevalent in Sweden) remains from the very early days of the band, although guitarist Joakim Johnsson has been around for a while having first stood in on bass back in 2003. 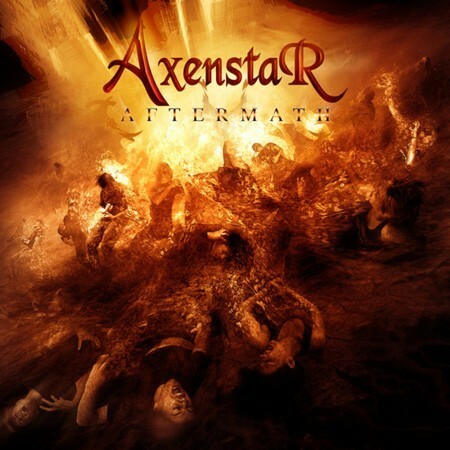 For all of those unfamiliar with the Axenstar attack; theirs is a brash, oft bombastic take on traditional power metal – all driving rhythms, pulsating riffs and anguished vocals embellished with the odd neo-classical keyboard flourish and the occasional progressive twist. It’s a tried and tested formula that has served them well over the years, and whilst part of me yearns for some more of the adventurous spirit displayed on the aforementioned ‘The Inquisition’, I have to concede that they seem to have gotten quite accomplished at it. So, whilst the likes of ‘Dogs Of War’, ‘Agony’, ‘The Dead Kingdom’ and ‘Aftermath’ aren’t exactly breaking anything approaching new ground; they’re all riff driven, precision engineered slabs of power metal angst. Production wise ‘Aftermath’ is easily their most sophisticated sounding set of songs to date (some might even say polished), and this further serves to accentuate the renewed vigour which the latest line up seems to have brought to the table. Still a supporting column rather than a crowning glory Axenstar are nevertheless moving ever forward, and with ‘Aftermath’ they’ve unleashed a commendable work which should light up the lower echelons of the power metal firmament. However, if they’re to move out of the shadows and into the spotlight to compete with the bigger boys, they’ll need to rely a little less on the raging riffs and vary their pace to inject more dynamics and drama into their repertoire.